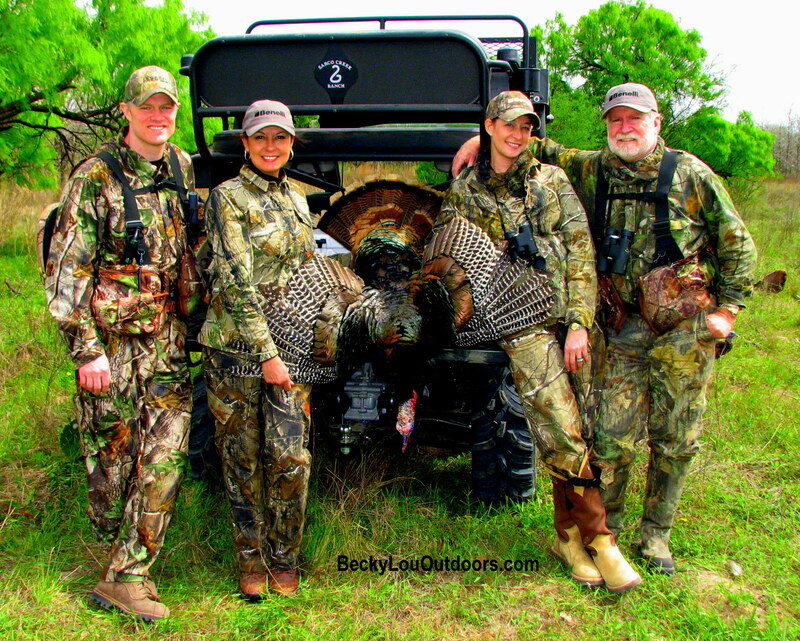 Franchi’s, Uberti’s, Turkeys, & Hogs… I may be in Heaven in Texas! This picture is from a women’s hunt for a television production of “Benelli On Assignment with host Joe Coogan” on Outdoor Channel in 2011. I was SO happy to get this Big Rio on the ground! This was definitely a group effort with (L-R) Jason Nash, Becky Lou, BIG BIRD, Cristie Gates & Joe Coogan. I later had him mounted in flight, and being brought back to life, he is even more beautiful. It was a unique hunt with a Jake coming straight into our decoy jake, and while giving it the beating of its life, it was the perfect lure for this huge lone Gobbler to come in for some action. The Jake was not backing down, and It was going to be a fight to the finish, until I finished the fight by taking the beautiful Rio with one shot to the head. We’ll also be helping Milton Greeson of Sarco Ranch deal with an overpopulation of hogs, employing various Uberti guns that will include SAA revolvers, 1885 High walls, 1874 Sharps and lever-actions. We’ll be stoking these guns with Federal ammo in a variety of loads, so there’s sure to be some exciting action and great stories to tell once the dust has settled! I am getting excited and there will be a story to tell on OutdoorHub.com in May! Packing for the trips are always the first http://ambienbuy.net challenge, but I think I have this under control, I am very confident with my new Prois MAX1 Camoflage clothing, with some Generation X and Ultra styles I should be fixed up for any type of weather. Being new to Prois, I am still in awe of the quality of these “fitting” pieces, absolutely amazing. I also think the RealTree MAX1 pattern will be perfect for this area of Texas for this time of year. Hogs have a nose that can smell for miles, but they will not be alarmed by my aroma. I am prepared with HerCAMOshop.com scent free bath & body products, to prepare, and then Skull Bound TV Scent Products White Oak Acorn scented soap, and literally using the “White Oak Acorn Scent Spray” as an after bath spray and in my hair! It smells good, and may have the deer licking out of my hand! Although a turkey’s sense of smell is little to none, I still practice scent control so that another critter doesn’t BLOW my turkey hunt! I learned a valuable lesson on one of my first turkey hunts when I was straight up BLOWN by a deer!With old man winter still rearing its head and hanging on for dear life this year, I will not be leaving without my comfy fleece HotMocs.com scarf to wrap around my neck and keep me nice and toasty! Although they will be providing the decoys for hunting, I will be toting my Ground Auger Decoy Stakes with me to make sure it is easy to move them if necessary. After using them on my last hunt, I will never be without them, it makes installing the stake effortless in any type of terrain, which is quite different than my experiences before. I leave TOMORROW and it could not come soon enough!! I am already thrilled about sharing the experience with pictures and updates on FB daily (See Tab above for Facebook Live Feed) and and it will all come together for a complete recount on www.OutdoorHub.com in May!